It has been 300 years since “The Fall” and the year is now 2563. Mankind has been separated by class. the rich and powerful reside in the clouds in the golden city of Zalem. while the rest of Humanity dwells in the scrap iron cities below. For those whom suffered injuries and life threatening ailments the only alternative is cybernetics. Welcome to the world of Alita: Battle Angel. Dyson Ido (Waltz) is a famous cyber surgeon in Iron city. On his routine trek through the scrap fields he procures spare parts for his operations. He discovers the remains of Cyborg that resembles a little girl who was in fact still alive. With spare parts Alita(Salazar) was reborn. Not being able to recall her memories she rediscovers what its like to live and discover all of her senses. One night she follows Dr Ido to discover he is more than he seems. This also triggers a fragment of her past. Now with a better understanding of who she Is, Alita is driven to discover her true potential and finish a mission she was tasked with long ago. Battle Angel Alita is a story translated from a Japanese manga from 1993 written by Yukito Kishiro. James Cameron was a fan of this story and was driven to adapt this for film. However he didn’t feel that current technology was up to standards to achieve what he wanted to make and shelved the project for some time. With production on Avatar in full swing, Alita had to take the back seat but for good reason. After the amazing work from Weta Studios Alita’s concept was well on its way to completion. Cameron handed the direction to Robert Rodriguez and Alita was well underway. 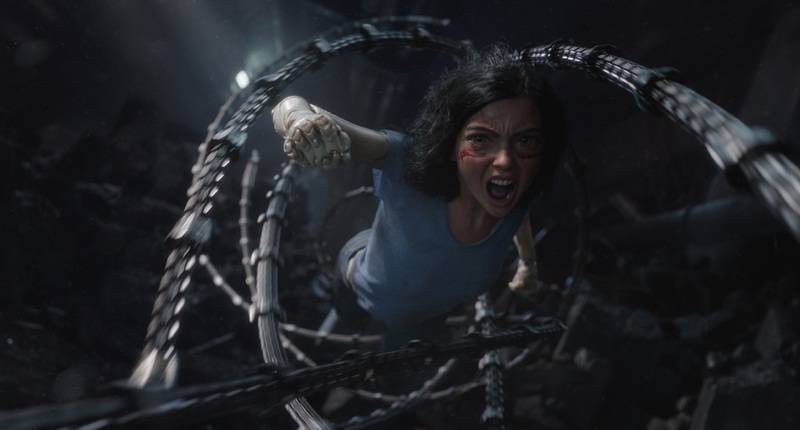 Motion capture has been replaced with motion performance where the CG capture was directly from the actors motions and facial reactions giving Alita a full range of emotion and personality. Unlike Avatars Photo Graphic environments based on a fictional environment. Alitas environments were considered PhotoRealistic where the environment is more real as well as more integrated with the living atmosphere. Many fans have already doubted this film. One factor being the ‘Huge Eyes’ on the main character. If you notice that Alita is the only character with that feature due to the fact that her model type is that of a doll and from a different manufacture from 300 years prior to current design. that should be reason enough for her different appearance. Another point that people try to make is that this is another failed attempt like Ghost in the Shell. When Ghost in the Shell was made, a lot of the story was changed from the original source material to try to blend the original story with the Stand Alone Complex. Boothe stories were very complex and trying to tell that story in 2 hours is a feat in itself. Alita is definitely a labor of love and its shows. this adaptation stayed very faithful to the source material. the elements that were changed helped bridge pieces of the story together and use the limited time very well. There was an Original Animation Video (OAV) of Alita released in the early 2000s. But rest assured this is one time the motion picture told the story better.